It has been estimated that around 30% of all kitchen designs in 2015 have some kind of work station or home office station built into them. The space shared in modern style kitchens incorporate elements such as charging stations for laptop computers and smart phones, and docking stations for setting up a small home office. This trend follows the rise of technology, and the fact that more and more people are using them, even in the kitchen. Isn't it annoying when your tablet or laptop powers down as you are relying on it to complete a dish? A full outlet isn't a pretty sight, so smart designers have added unobtrusive outlets that pop out when you need a quick charge. The time for indoor kitchens dominating the landscape is over. Move over, as outdoor kitchens are becoming more and more the trend for people living in Singapore. This 2016 kitchen design is more than just for weekend barbecuing; instead of portable stoves and grills, you get installed kitchens and complementing seats out in the sun. Experts say that the kitchen is perhaps the most sociable room in the house, as all year-round home events make use of this space to cook or as venues for social gatherings. Once the kitchen goes outdoors, homeowners and their relatives can take advantage of the beauty of nature, and its reputation will only be strengthened. One of the best materials, whether for your kitchen floor, for your cabinets or countertops will always be wood. 2016 will see the resurgence and dominance of wood in kitchens far and wide. In fact, more and more people are preferring wood more than any other material for kitchen flooring; hardwood floors in particular. Whitewashed flooring works great with almost any color palette combination, while brown and grey hardwood floors can compensate for a kitchen's lack of color theme. 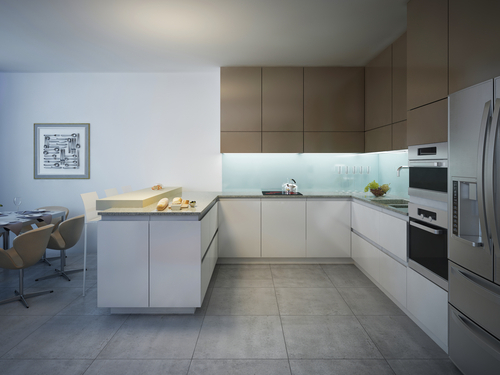 Other materials such as porcelain and ceramic can be used in conjunction to create a truly unique kitchen (more on this later). What is it about wood that makes it the all-time favorite material that never goes out of style? It could be the undeniable charm it provides, the look and the atmosphere it creates, or maybe its durability and natural beauty to make a property feel truly like home. Bare-bones is the new look of 2016. Gone are the days that a kitchen is stacked up high with pots and pans, knives, kitchen appliances and a hundred other minor kitchen ornaments and tools. 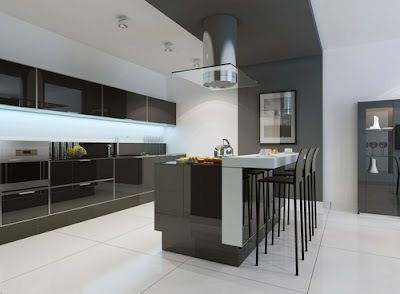 Minimalism design has affected kitchen space and provides a clean look that is appealing to many. There's less things to get distracted by. Less embellishments, and homeowners will get to see how their countertops look maybe for the first time in a long while. Simple accents dominate the kitchen space and landscape, making way for more pronounced features such as backsplashes and lighting. If you're having a hard time thinking about minimalism, then think this: simple, clean and utilitarian is the 2016 trend. A house might have more storage space in kitchens than any other room in the house. It makes perfect sense when you think about it- more storage means you can put all those pots, pans, china, glassware and coffeemaker somewhere people won't see. Innovation in kitchen technology have produced conveniences such as tall pantry designs and rollout spaces are welcome and an excellent addition in any kitchen. Hidden chutes where you can put in recyclable and non-recyclable waste as you cook, pullouts that you can use to store your spice in, charging drawers and docks for your electronic gadgets, and much more. Decluttering and minimalism is the current trend, and having tuck-in storage spaces help you achieve that look without throwing away all your kitchen elements. While its often true that a kitchen is designed with primary whites and greys, bold kitchen trends showcasing different color blends are starting to emerge. 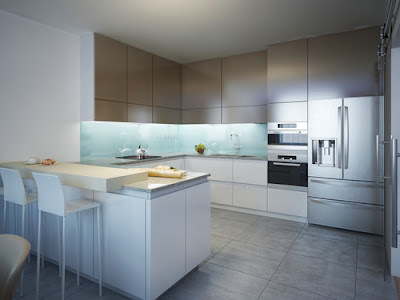 Cabinet colors can take on two or more synergistic tones, with the emphasis on the contemporary. The same style holds true for countertops. Earthy wood countertops are becoming more and more commonplace, with granite-made and quartz-made ones following closely behind. Combinations of wood, stone and stainless steel, set in a minimalistic kitchen style open up a slew of choices for homeowners. Shaker cabinets add to the undeniable charm of wood and overall minimalistic style. Open shelving has also recently gained new light in 2016- you can see the contents 24/7. Goods stored in open shelves save the homeowner time as they won't need to rummage around endlessly for that salt shaker, though it isn't really recommended for those who want safety more than anything else. Coffee and liquor have become staples in any home, so modern designs and trends take those elements in and seamlessly add them as built-in components. Espresso and coffee stations have left countertops and aren't portable anymore- you just pull them out, and proceed to make a steaming mug of coffee with it. Wet bars and wine refrigerators have become standard as well for many kitchens, which people can pull out and make some drinks after a day's hard work. Finally, as pets are becoming more and more present in many homes, it is only natural to include feeding stations where your feline or canine companions can see you. Pullout feeding bins, cat or dog food storage, crates and even built-in beds are great to have. This trend clears up clutter and any potential mess as you might step on traditional feeding bowls while cooking food.